While packing for vacation can be a pain, there is nothing more exciting than getting to your destination and being ready to have some fun in the sun! At Nicole Marie Salon, we don’t want you cooped up inside spending hours on your hair, so leave the blow dryer at home and read up on our best ideas for Vacation Hair! On the beach it is all about letting your natural waves and texture flow. You won’t need to throw a lot in your luggage either, just bring the essentials. We suggest a sea salt spray, curl creams and mousse and bring along a wide-toothed comb. Also, transfer your shampoo and conditioner into smaller containers or buy the travel sizes. Now once you are there and ready there are some great and easy styles to rock while out and about. 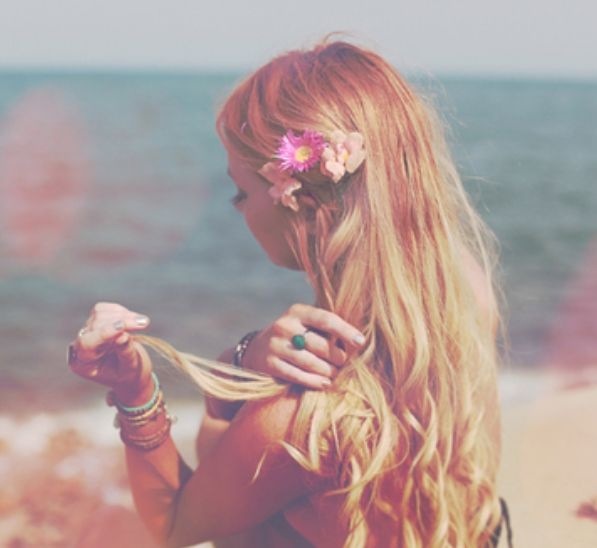 Beachy natural waves are a go-to. You can let you hair air dry and apply some sea salt spray for when you want to let you hair down. At Nicole Marie Salon, we are always a fan of the braids and what better time to rock different ones when you are on vacation. You can wear them messy, just a few small ones, or all back in a french braid or fishtail. The options are endless and if you braid hair when wet, it is a perfect way to get those waves after the beach for a dinner date. The messy bun is a great way to be able to get your hair out of your face and still look great. If your hair frizzes, this is an easy way to keep it tamed from the heat. Depending on however you pull it up, the messy bun is versatile and can transition from outdoors activities to a fancy evening with no problems. If the laid back vacation hair is boring you, then you can always jazz it up with hair accessories. We love anything from beautiful, blooming flowers in your ear to hats and turbans. Hair accessories are a fun and easy way to add a little something to air dried waves. Vacation hair is a fun way to brighten up your everyday work looks while laying on the beach. Visit us at Nicole Marie Salon for products and more ideas to bring along in your luggage!